You can buy them non-GMO, organic-certified. There are only 60 calories in a rice cake (some brands have fewer). The plain varieties contain no saturated or trans fats. I like them because they are versatile, fairly inexpensive, and crunchy. Back to their versatility, though. 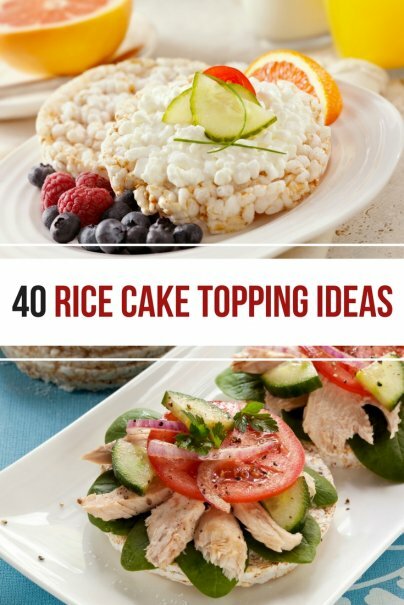 Below are forty suggestions for topping rice cakes. I eat a lot of rice cakes at work, because I hate it when my sandwich bread gets mushy. Simply pack the toppings separately from the rice cakes, and assemble at lunchtime. Don't have an egg salad recipe? Now you have 12. Often made with mayonnaise, Max's favorite secret ingredient. I usually add a squirt of Dijon mustard. I like mine with Dijon mustard and green onions, as in this devilled ham recipe (just use green onions instead of yellow). With sprouts and some of that delicious spicy horseradish mustard … so good. For a more Italian flavor, try salami or pepperoni with mozzarella , olives, and a tomato slice. I like to microwave that one briefly, just to melt the cheese. Emergency pizza! There's nothing wrong with the basics. and honey, or jelly. An even better basic. When I get home from work, I usually have a snack. By keeping rice cakes handy, I can conjure up something delicious. Here are some of my favorites. I could just eat tapenade with a spoon and be happy. A rice cake holds more tapenade than a spoon, so that makes me happier. I'm still not tired of salmon, even after this post. 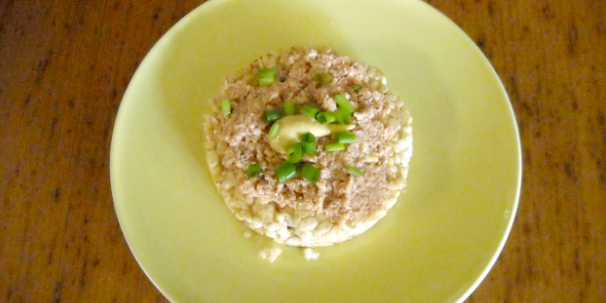 Salmon spread is great on a rice cake! Smoked salmon with capers (drain them) is also delicious, albeit expensive. Camilla has 21 uses for pesto, and I'd like to add #22, which is to spoon it over a rice cake. Veggie spreads? Mark Bittman of the New York Times has developed several variations. I particularly like the broccoli with parmesan, pine nuts, and olive oil. Swoon. I also like the bean dip that comes in a can, at the grocery store, by the tortilla chips section, on a rice cake. That works. While we're on legumes, don't forget about hummus. My daughter thinks the one with roasted red peppers is the best. If your store doesn't carry it, here's my favorite hummus recipe. Again, thin layer, folks: Pimento cheese. Yum! If you just want instant gratification in a pimento-cheese like fashion, heck, you can get that cheese that squirts out of the can. Don't judge me. Turns out that rice cakes are an excellent vehicle for hot artichoke dip. They are sturdier than dumb ol' crackers. This stuff is dangerously good. I like to add a can of mild chiles for a little more zip. Slice up some pears, thinly, add to your rice cake along with some baby spinach, and sprinkle with bleu cheese. Let's try Mexican flavors: To a rice cake add sliced avocados, salsa, and cilantro. When I am starving, I just plop a tablespoon of low-fat cottage cheese onto a rice cake and call it good, because it is. Combine chopped avocados, cilantro, cherry tomatoes, a little olive oil and garlic salt and try that on top. Delicious! We have an avocado tree. It's one of my favorite things in the whole world. My husband started it from a seed. They are delicious, so sometimes I just eat sliced avocados (or guacamole) on a rice cake. Why not? It's a low-calorie starch to round out any meal. Cornbread with chili is great, but so are rice cakes, particularly if you get the cheesy ones. If your chili is really thick, just spoon it on top. I used a little low-fat sour cream on top of that combo. Gluten-free croutons! Just break a rice cake into pieces and float it on split-pea, tomato, or any creamy soup. Bacon, Lettuce, and Tomato . . rice cakes? Sure, why not. 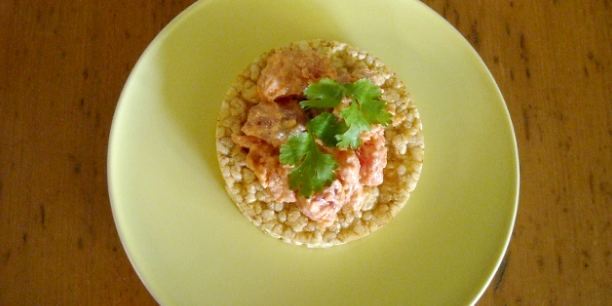 I live on the Island of Hawaii, and so I took some of my favorites and rice cake'd them: Spicy Ahi Poke with Cilantro. Caramelize sliced Spam in medium-heat frying pan with shoyu (soy sauce). While you are heating the Spam, fry an egg. Assemble in layers of rice cake, Spam, and fried egg. If I were really making it correctly, I'd add gravy on top. I had fun making this one. Mix crab (fresh or canned, drained and flaked) with mayonnaise. I added a few drops of Sriracha sauce to mine, but it's spicy, so be warned. Place crab mixture on rice cake and add some chopped avocado, a little grated carrot, a drizzle of sesame oil, and sprinkle with chopped nori (sushi wrapper). This really hits the spot. My daughter likes a drizzle of honey on that one, too. My husband suggested we try "cinnamon toast" flavors — yum! Spread a thin layer of butter, and add a sprinkling of cinnamon and sugar. I couldn't remember the last time I had had cinnamon toast. You were waiting for this one, I know. NUTELLA. That's all I have to write about that suggestion. While we're on chocolate, you can make a S'more rice cake from the aforementioned Nutella. Add some mini-marshmallows. Devour. Again with the light cream cheese — but this time, slice some strawberries and put those on top. 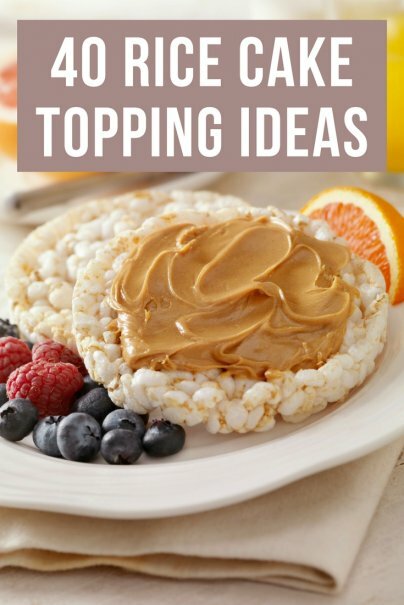 What do you like to top your rice cakes with? When I was living in Philadelphia, I used to take the bus up to New York once a week for classes, and I'd always bring two rice cakes topped with almond butter and raisins to snack on. I love the crunch rice cakes provide without being too dense. Sometimes I'll eat them with chili or crumble them on top of a stir-fry. on my brown rice cake, i spread raw peanut butter on top, with half of a banana sliced on top of that. i add a lil bit of powdered cinnamon, and microwave either straw, rasp, blue, black or cranberries and pour that on top. it's super delicious, and real healthy. Brilliant article on rice cake sandwiches, I've just given up bread, so this is just what I was looking for. Plus now I'm inspired to make Baba Ghanoush. Do you know, is it posible to BBQ the eggplant for BG? Thanks for a great blog. No cream cheese and peanut butter, or did I somehow miss that? That's been my favorite combo since I was a kid. Why even bother eating rice cakes if you're going to slather it in peanut butter, nutella, or canned cheese? Just found your blog after I tried using plain rice cakes out of desperation as a bread substitute for my favorite snack - I (carefully and watchfully) crisped one up in my toaster oven, and topped with chopped orange bell pepper, a slice of low sodium american cheese and a sprinkle of garlic powder. White pizza, of a sort :) Been my fav snack for decades on very thin bread but celiac left me sadly missing it. Hummus is v.yummy. And my all time favourite, apple sauce out the jar spread thinly on! I like eating them plain as a study snack :P I never thought of putting stuff on it since I like the rice flavour so much! Now I can have a bit of jam when I'm pushing out that essay~ Thanks for the post! Toast it and spread on honey and peanut butter, put on banana slices, and top with some cinnamon --so satisfying. Peanut butter, jelly, black beans and a few drops of hot sauce. I like to do a bit of cream cheese and some salted cucumbers for breakfast, or even just a snack. 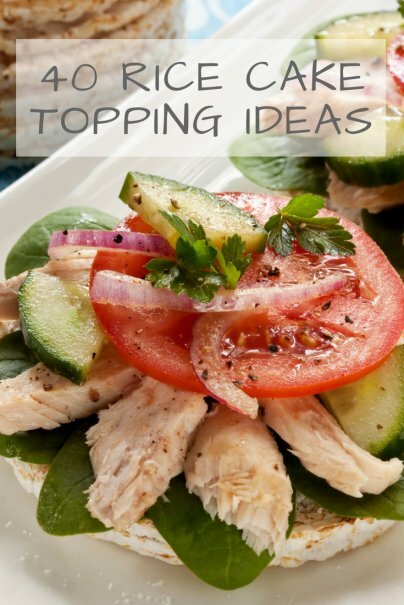 If you have time try adding sliced tomatoes and arugula on top as well. Delicious.